What are the Termas Geometricas? 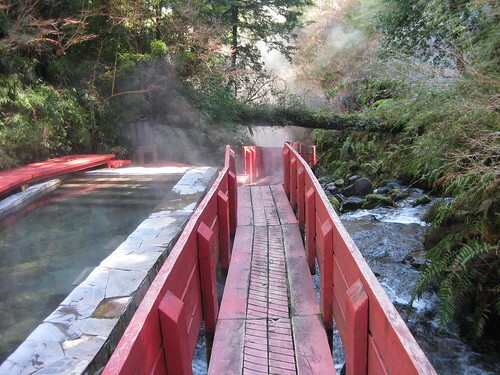 The Termas Geometricas are a hot springs complex nestled in a narrow, lush green canyon near Pucon, Chile. 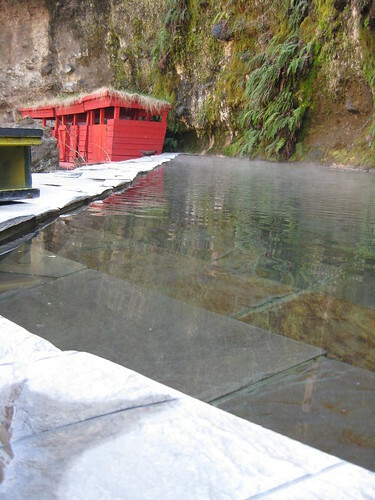 Literally translated, the Termas Geometricas mean “Geometric Spa”, “Geometric Thermals”, or “Geometric Hot Springs”. The complex consists of 17 water pools (both hot and cold water) fed by both hot springs and several waterfalls. Once inside the gate, you walk along an elevated wooden walkway that winds through the narrow canyon. There are hot and cold pools along the path that you can stop and visit. The walls of the canyon are covered in heavy vegetation and the entire location has a wild, rustic feel to it. This is not just a hot springs in the mountains, it is a total visual and sensory experience. How do you get to the Termas Geometricas? 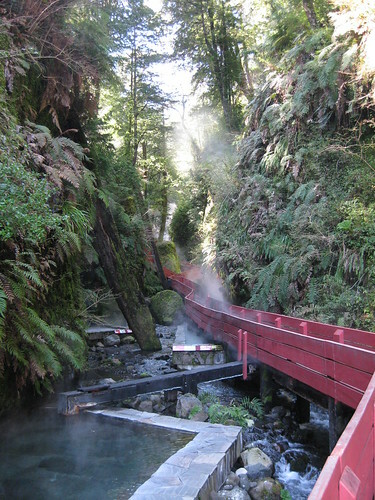 The Termas Geometricas are located south of Pucon and Villarica in southern Chile. From Villarica, head south towards Lican Ray. From Lican Ray, follow the road south along the edge of Lago Calafquen to the town of Coñaripe. From there you’ll head northeast on a dirt/gravel road for about 17 kilometers. Watch for the signs and don’t be surprised if goats or cows are meandering in the roadway. We had a 4×4 jeep that handled the gravel road well. Once we got to the Termas, we saw small compact cars — so those can probably make the trip too. How much do the Termas Geometricas cost? Admission fees vary based on the time of day. However, adults pay around $16,000 pesos or about $35 USD. Children and seniors are cheaper — up to a 50% discount. Take cash (Chilean Pesos) with you because they don’t accept credit cards. There are pavillions scattered along the path to the pools where you can change your clothes and store them in lockers. When you pay for your entrance, you can get a towel and a padlock for your locker. Each pool has a temperature posted (in degrees Celsius) so you can decide if you want to try it or not. If you get hungry, a small kitchen is located near the entrance where you can purchase sandwiches, soups, and delicious kuchen. The Termas Geometricas were the highlight of our visit to this region of Chile and I highly recommend them! Visit the Termas’ website for more details.